Restorative Yoga and Aromatherapy Massage with licensed massage therapist and yoga teacher, Sandra Sādhāna. 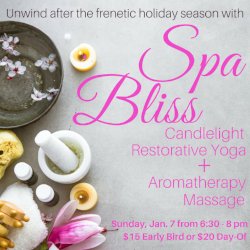 Unwind after the holiday season with this candlelit restorative class of supported yoga postures and therapeutic massage during an extended savasana. Sandra Sādhāna (LMT, E-RYT) will guide this soothing floor-based class to calm the nervous system, soften physical tension and release energetic stagnation. Followed by detailed facial massage with organic essential oils used to rest and rejuvenate. Restorative yoga class plus a mini spa treatment!